Reporters at media centre of Boao Forum for Asia watch Chinese President Xi Jinping delivering his speech at the annual forum, in Boao, in the southern Chinese province of Hainan, Apr. 10, 2018. China’s President Xi Jinping did not mention U.S. President Donald Trump by name or speak directly about rising trade frictions with Washington during a closely watched speech at the Boao Forum — China’s version of Davos for Asia. But the pledges Xi made to press forward with economic reforms had everything to do with the trade dispute and President Trump’s threats to levy heavy tariffs on Chinese goods. In his speech, Xi mentioned the phrase “opening up” 42 times. One of the key messages of his speech was that China was open for business. It was also an effort, one analyst said, to highlight a contrast between Beijing’s approach and Washington. In his speech, Xi said China would launch a number of landmark measures this year, including cutting tariffs on car imports, one key trade barrier President Trump has mentioned repeatedly. China places a 25 percent tariff on automobile imports, while Chinese vehicles exported to the United States are taxed by two and half percent. 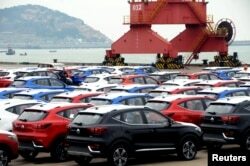 Sports utility vehicles (SUVs) waiting to be exported are seen at a port in Lianyungang, Jiangsu province, China, Apr. 5, 2018. Xi re-stated a pledge to open up China’s financial sector — easing restrictions — and accelerate the opening up of the insurance industry. He also said China would restructure its State Intellectual Property Office this year to step up law enforcement, raise fines for violations and strengthen legal protections. Some analysts said the pledges were nothing new and unlikely to amount to the type of concessions that the Trump administration is expecting. Others, however, said there might be enough there to at least help the two move toward sitting down to talk. The United States has proposed placing tariffs on about 1,300 Chinese imports, which amounts to about $50 billion in trade. Late last week, even as he disagreed with the characterization of the dispute as a trade war, President Trump upped the stakes by asking for $100 billion more in tariffs. China has responded with a list of its own, some 106 products that target among other things agricultural production in areas where political support for Trump was strong in the 2016 elections. 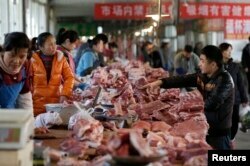 Beijing has already put a 25 percent tariff in place on pork products, in response to Trump’s earlier tariffs on steel and aluminum. And if Beijing’s recently announced tariffs go forward, soybean imports from the United States could also face a 25 percent tariff. The impact that could have on American farmers is already raising concerns. So much so that the White House announced Monday it is drafting up a plan to protect farmers and make sure they don’t bear the brunt of Chinese retaliation. That is why it is hard to predict just how far Xi’s remarks may go in helping the two sides resolve their differences, said Oliver Rui, a professor of international finance and accounting at the China Europe International Business School. “The issue is very complicated. It is not just the trade imbalances between the two countries, it is also related to political issues. The mid-term elections will definitely play a role here, the attitude of the EU will also play a role here,” Rui said. 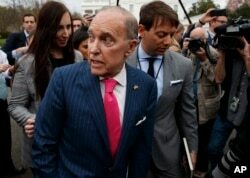 Several days ago the White House chief economic adviser Larry Kudlow said that the Trump administration is building a “coalition of the willing” to jointly take on China over its trade practices. Kudlow has not yet said which countries might be a part of that grouping, but the European Union is one likely partner. The United States is not the only country concerned about China's trade practices and increasingly analysts who have been arguing against tariffs have noted that working with other countries could have an even stronger impact. That is something that President Xi appeared to be hinting at in his speech and that might be a point of concern for Beijing. “We should pursue the path of dialogue, not conflict, building partnerships and not alliances as we forge new paths in relations between countries,” Xi said. This story was written by VOA’s William Ide in Beijing. Joyce Huang contributed.